Speechless serenity abounds when living in this home that makes you feel like you’re on vacation year round. Approaching the front door down the walk street is mesmerizing since the beach and ocean are merely paces away. Upon entering the home you are immediately charmed by the interior shiplap walls and oak hardwood floors. This sophisticated yet warm inviting home is flooded with light from the plethora of windows and skylights. On the first level is a beach room directly off the walk street patio, perfect as a gym, yoga/meditation room or kids hangout. There are also two bedrooms (one currently used as a den) and a bathroom as well as laundry room and 2 side by side two car garages (four car interior parking). 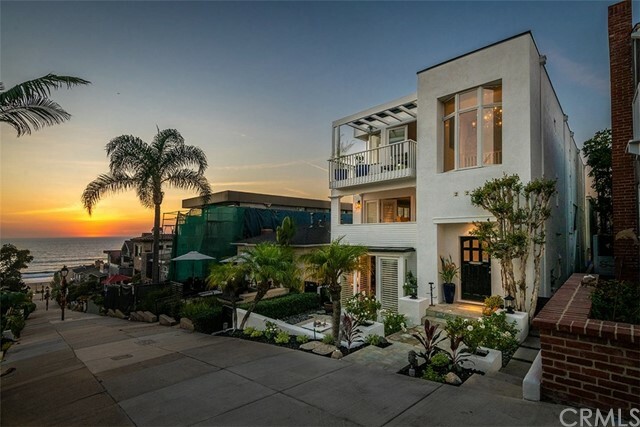 The middle level is graced with a large inviting master suite including a breathtaking ocean view deck and huge closet. Down the hall are three additional bedrooms, one bath room, one loft/office and spacious back deck. The top floor however is the soul of this home. With the Pacific Ocean visible from every room and deck, you are immersed in the home’s essence once you arrive upstairs. Entertaining is seamless with formal living and dining rooms, built in “captains bar”, kitchen, nook and family room surrounded by three large decks with French doors that when open provide a luxurious yet cozy inviting space you won’t want to leave…. © 2019. The multiple listing data appearing on this website, or contained in reports produced therefrom, is owned and copyrighted by Multi-Regional Multiple Listing Service, Inc. ("MRMLS") and is protected by all applicable copyright laws. Information provided is for viewer's personal, non-commercial use and may not be used for any purpose other than to identify prospective properties the viewer may be interested in purchasing. All listing data, including but not limited to square footage and lot size is believed to be accurate, but the listing Agent, listing Broker and MRMLS and its affiliates do not warrant or guarantee such accuracy. The viewer should independently verify the listed data prior to making any decisions based on such information by personal inspection and/or contacting a real estate professional. Listing courtesy of Lauren Forbes from Compass . Last updated Thursday, April 18th, 2019.